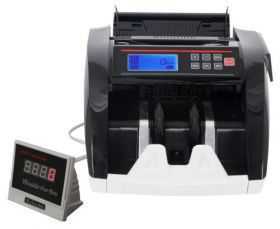 The High Roller® LCD Bill Counter features both UV (ultraviolet) and MG (magnetic) automatic detection while counting. Automatic start, stop and clearing functions. It has a front LCD display, side display and includes an external plug in display. Counting speeds of up to 1000 bills/min. Highly accurate counting of bill quantity. Does not count mixed denominations.